Small Bites - If it tastes good, eat it! I'm passionate about technology, especially technology that has an educational benefit. Occasionally I'll get vocal about those sort of things here. Feel free to share these ideas - with attribution. Is That a Piece of Paper or an Audiobook? As I make my way through my daily life I often find places where the analog and the digital parts of my life try to intersect and fail. One of my favorite things is finding workflows to help these two halves of my life merge. I absolutely love audiobooks and podcasts, they are a favored form of entertainment. Audio medium seems to fit the way my brain works. Whether for entertainment, or learning new, cool stuff, it just fits me. The idea here is to convert words on paper into an audiobook in just a few minutes. So, just what voodoo am I up to? Enter a new workflow that I've cobbled together from a couple of favorite, albeit radically different iOS apps. This workflow transitions paper (any paper) into very well done spoken word. Scan+ from Smile software is an amazingly good scanning and OCR app for iOS devices. For those not familiar with OCR, it's a software process that turns an picture of text from a simple, static image into digital, searchable text.The Scan+ app does an incredible job of capturing an image of a physical piece of text such as a magazine article, or a group of pages from a book and performing OCR. With just a few minutes time you can actually photograph/scan and OCR an entire chapter. The digital version you end up with looks just like the actual page and is completely searchable, even editable. Yes, I know, I can just hear the publishers rolling over in their graves. Caveat here... you should only do this process on materials you have already purchased. You are in effect making a digital backup of books you already own, right. For the second part of this process we need one more app. Voice Dream from VoiceDream.com is a text to speech (TTS) app that does a really nice job of converting digital text into something that is actually pleasant to listen to. The offer in-app purchasing for a wide range of voices so you can customize your listening experience to suit your tastes. My current favorite voice is Rachel, a female British synthetic voice. Ok, I feel you cringe at the idea of synthetic voices but these folks have gotten this stuff right in a way far better than anything that has come before. Synthetic voices at the consumer level really has come a long way since the last time you checked it out. If the custom voice isn't precisely to your liking you can even adjust speech rate and pitch as well as (of course) volume. If you don't like the default voice (let's call her Heather) then you can pick up one of her digital friends, perhaps Graham, Peter, Lucy or one of a dozen or so others for $1.99 - $2.99. I'm not quite sure why the variability in price but they are all quite easy to listen to each in their own way. You can listen to a sample of each for free and decide who you want to have read to you. VoiceDream can watch over and read files to you from your Dropbox, Google Drive, Pocket, Instapaper, Evernote or Bookshare accounts. You can point VoiceDream at a web page and have it read to you. On the fly, you can even have VoiceDream read to you from your clipboard. Let's start with capture in Scan+. Find a piece of paper and aim your iOS camera. This can be a page in a book, a letter, a magazine... pretty much anything. Tap the camera icon to snap a picture of this paper. Once you're happy with the shot (generally the first shot is great) then you adjust four blue dots to define the corners of the shaded area that represents the text on the page. Tap an arrow to proceed and you're presented with a refined image of the text. Got more pages to scan? Click the "+". When you're done photographing your document, the page is filed in the storage area of Scan+ on your device. Click it to rename the file. Now comes the fun part. Click open the file and choose OCR from the menu and choose OCR Document. There is a perverse satisfaction to be had as you watch the yellow highlight progress indicator blast down the page. What would you like to do with this next? Tap the wrench icon and choose Share. From here you can email, open in PDFpen (another awesome app from Smile), open in another doc, copy to Dropbox, Evernote, Google Drive and any of several other options. The point here is we have several things we can do with our finished file and several of them are readable by our next app in the workflow. Let's just assume for now that I filed this document to Dropbox. 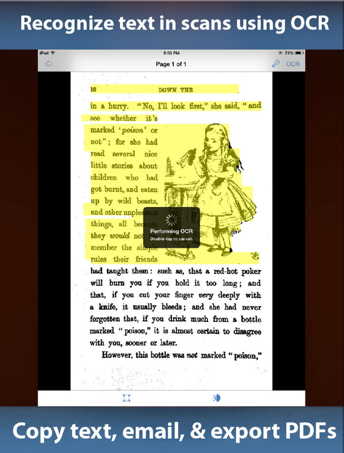 VoiceDream needs access to sources of text to read to you. You will need to grant it access to each of these sources. Dropbox, Pocket, Google Drive and more become libraries of readable text. From these sources you can create playlists to listen to multiple articles. Playlists are great to use on a long commute, or while you exercise. As the voice of your choice reads the article, you can even view the text being highlighted as the narration progresses. Page of Paper or Audiobook from Terry Austin on Vimeo. Ever searching for that bleeding edge in educational technology.